Is it just me, or was it better seeing trailers for the first time at the cinema? "The Star Wars trailer is out!” my colleague shouts. Huddling around her desktop screen, we watch the first new images of the franchise to be released in years. It’s awe- inspiring. It’s shiny. It’s emotional. Flash-forward six months. I sit at the cinema, gritting my teeth through ads: here are the banks, flailing to earn our goodwill; the car manufacturers, trying really hard not to make cars boring; and the smooth party scenes peddling booze. The usual title cards flash, and it’s finally time for the trailers. I relax my jaw. "In comes the all-too familiar ‘braaaam’. It’s the Star Wars trailer." And then, in comes the all-too familiar ‘braaaam’. It’s the Star Wars trailer. Again. By now, every single one of its beats is familiar – and not in a good way. In the age of the internet, it’s never been easier for studios to market new movies to us. But no longer do we get the pleasure of discovering an anticipated film at the cinema, with all the majesty of a display larger than our desktop monitors. Now, in front of the big screen, we brace ourselves for a second, third or fourth re-watch. And it’s making us bored, and not a little frustrated. The question is, are there ways for the studios to make it better? They need those bums on seats, after all, and there must be less brutal methods to get them there than force-feeding the same content again and again to captive audiences; not least because as soon as we recognise those familiar opening shots, we reach straight for our phones – cinema rules or no. The heads behind Alien: Covenant might just have found a way forward. Ahead of the film’s release, two ‘prologues’ were launched online – short films giving us background on the story (and featuring cameos from Noomi Rapace and James Franco). 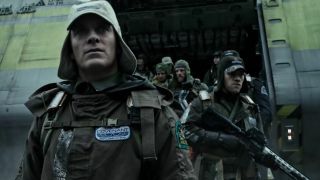 Alien: Covenant struck the right note with its online prologues. So why can’t we get more movie promotions along these lines? Why not give us fresh material to whip up curiosity, alongside traditional trailers? Couldn’t the studios show new, exclusive scenes at the cinema and leave the trailers to the internet, or vice versa? In this age of ‘content is king’, perhaps more content is the way forward, rather than just pummelling audiences with the same thing over and over again. Or is it just me? Each month our sister publication Total Film magazine argues a polarising movie opinion and gives you the opportunity to agree/disagree/tell them they're mad. Let us know what you think about this one in the comments below and read on for more. Is it just me, or are the best sequels belated ones? Is it just me, or were movie stars better before social media? Is it just me, or is Batman Returns the best Bat-movie?